Italian christening gowns are a popular choice for heirloom-quality apparel. Italy has a strong Catholic history, so it makes sense that gowns for christenings might hail from that country. Whether your baby is christened in a Catholic church or through another denomination, you'll appreciate the quality and uniqueness of these beautiful gowns. The following websites offer different degrees of authenticity when it comes to how Italian they truly are. While some of these gowns cost more than 600 Euros and are handmade in Italy, it is also possible to find gowns that are simply modeled in the Italian style. Replicas can be purchased for a small fraction of the price. Based in Florence, Italy, Assunta Anichini has been making quality children's clothing since 1912. Specialized in fancy and traditional clothing, such as christening dresses, christening suits and flower girl dresses, this company offers several different types of beautiful dedication apparel. Handmade and embroidered, and made of exclusive silks and linen, these christening dresses and suits start at just under 250 Euros, and can top 600 Euros depending on the style, fabric and size. Based in the U.S., Little Dickens Shoppe has christening dresses and suits, as well as accessories and gifts, available for purchase. Whether you want a beautiful, yet affordable christening dress, or you want a handmade silk gown based on the Italian style, you can find it at this webshop. Another U.S. webshop, featuring a wide variety of options is Pink Princess. With a broad selection of both girls' christening gowns and boys' christening outfits, this shop carries a nice selection. The site features brand names like Baby Trousseau, and it also features a discount christening gown section so that you don't have to break the bank. Traditionally, both boys and girls wore christening gowns when they were dedicated. Nowadays, many parents dress their daughters in christening dresses and their sons in christening suits. The choice is up to you, and there are still many baby boys who are dedicated in christening gowns. In addition to the main piece of clothing itself, most babies will wear a special white pair of booties with their christening gown or suit. In colder seasons, tights may also be worn under the dress, and a blanket is a common accessory for wrapping the baby up to keep him or her warm. Generally, sweaters are not added over the gown or suit because the main apparel is simply too beautiful to cover up. Babies often wear a white cap or bonnet as well (taking this off for the actual ceremony itself). Christening dresses and suits made in Italy or in the Italian style are often made of silk fabrics. While expensive and not the easiest to clean, these fabrics have an unequivocal shine and beauty, not to mention softness. Make sure to test your baby's sensitivity to the fabric before the big day to make sure that your child is not allergic to his or her christening apparel. 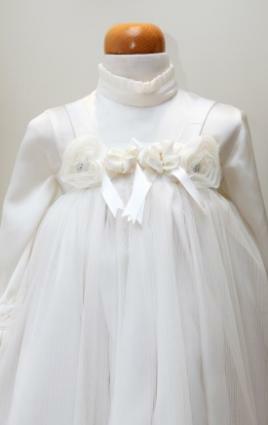 Italian christening gowns are often all white, however, some dresses are accented with pink or blue ribbons or embroidery. Depending on the style you prefer, an all-white version with white embroidery, lace and ribbons can be stunningly beautiful, while a splash of color can add a focal point to a white gown. Traditional christening dresses and suits from Italy are still handmade. Don't forget that these are of heirloom quality and can be worn by several children, either of the same or of different generations. While a baptism gown can be a considerable investment, your baby's christening will be a very special day, not just for you and your baby, but for your entire family as well. Investing in a family heirloom can provide generations with a traditional piece of clothing whose meaning only increases each time it is worn.